Take coriander leaves. Cut green chillies into small pieces. Add peanuts, salt, sugar and lemon juice. Grind it well into the mixture. Your chutney is ready. Take a pressure cooker, add 3 glasses of water and boil it. Add corn kernels in it and close the lid. Pressure cook it for 3 whistles. Let the cooker cool. Take out corn kernels in a colander and let the water drain. Keep it aside. You can also use canned boiled kernels. Take a bowl. Add corn kernels, potatoes, bell peppers, tomatoes, onions, salt, chat masala and mix it well. 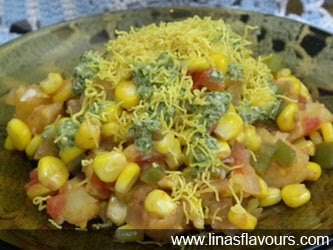 For serving take bowls, put corn bhel, pour green chutney, sprinkle besan sev and serve it. Note: You can even add grated cheese.